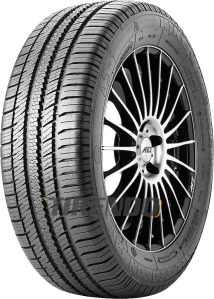 The all-season tyres of German production “King Meiler”, the AS-1, characterised by asymmetrical, non-directional profile design with clearly recognisable summer + winter side. Optimal performance on dry + wet roads + maximum winter grip. Linear grooves in the tread for additional road grip. Made in Germany. Tested by TÜV-Nord and tested by Testing Laboratory Nord!